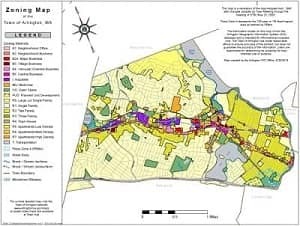 The Arlington Redevelopment Board on March 27 voted to send an amended version of zoning changes to Town Meeting for consideration at its annual meeting starting April 22. The revised articles roll back some proposed changes and require some developments to include additional affordable housing to garner favorable zoning rules, but critics see significant loopholes and maintain their concerns. “I think these articles strike the right balance,” said ARB member Gene Benson in an interview, speaking as individual and not for the board. He said the board is trying to encourage development in the town’s commercial corridors that will result in more housing, more usable commercial space, and more affordable housing. The ARB approved its amended report to Town Meeting on April 8. The zoning changes would allow developers to build structures with more units, more stories, more square footage and less open space and fewer parking spaces per unit. The changes apply to medium- and high-density residential districts and business districts, primarily along the Mass. Ave. and Broadway corridors. Under current zoning rules, any development with six or more housing units must designate at least 15 percent of the units (or one out of six) “affordable.” An affordable-housing unit is available to residents with income up to 70 percent of the area median, and the tenant’s costs including utilities may not exceed 30 percent of the tenant’s income. In public comment leading to the ARB vote on the proposed articles, opponents and skeptics outnumbered supporters by about 2-to-1. Critics said the zoning changes brought no guarantee of increased affordability and could in fact reduce availability of affordable housing, at a cost to the town’s livability. “[T]enants in older, more modest apartment buildings will be displaced by the construction of high-end luxury apartments that they cannot afford,” wrote Jo Anne Preston in a recent letter to The Boston Globe. Skeptics cite a Chicago study by MIT researcher Yonah Freeman that found after “upzoning” – the type of zoning changes proposed for Arlington – housing prices rose while the supply of housing did not. The ARB says the revised zoning proposals mitigate such concerns by making the favorable zoning changes – bigger buildings, smaller yards, and smaller lots – available as a reward for developers who agree to build extra affordable housing. To get the so-called “density bonus,” a developer must provide one more affordable unit than required. That translates to two units instead of one in a six-unit development, and four units instead of three in an 18-unit development, for example. Proposed zoning changes were published in a warrant delivered to all town residents. The town Redevelopment Board voted on an amended set of articles on March 27. Articles 6, 7, 8, 10, 13: Increased density and size allowances, reduced upper building step-back requirements and reduced parking requirements (1.25 parking spaces for 2BR units, 1.5 for 3-plus BR units) were incorporated into Article 16, with the exception that rooftops will not count as open space but balconies will. APPROVE as footnotes to Article 16. Article 9: Increase size of townhouses. APPROVE ORIGINAL. Article 11: ARB opted not to reduce the distance within which a height buffer is required, but clarified the finding that needs to be made to allow building to exceed certain height. APPROVE as AMENDED. The articles provide a notable exception: Developments with five or fewer units get the favorable zoning changes without building any affordable housing units. Critics say this increases the incentive to developers to build housing with fewer than six units: A structure with five units gets the density “bonus” for free, while a structure with six units must build two affordable units to get the bonus. Don Seltzer, a member of Arlington Residents for Responsible Redevelopment, calls this a “huge loophole.” The proposed articles also reduce the minimum lot size for multifamily housing from 20,000 square feet to 5,000 square feet. Seltzer expressed concern that the articles provide an incentive to subdivide larger lots, build five units on each, and rent all of them at market-rate, circumventing affordable housing requirements. ARB member Benson, in a separate interview, downplayed such concerns, saying current bylaws prohibit subdividing if a developer plans to build on the subdivided lots within two years. Benson said it takes between three and five market-rate units to be able to cross-subsidize one affordable unit. He said the exemption for developments with five or fewer units is a “reflection of reality” – that it’s too costly to include affordable units in smaller projects. The density bonus is contained in a revised version of Article 16, which as originally proposed increases the requirement for affordable units from 15 percent to 20 percent in developments with 20 or more units. That tiered requirement is still part of Article 16, originally drafted at the request of resident Stephen Revilak and 10 registered voters. Revilak, in an interview, said he supports the amended articles. Asked why residential developments with five or fewer units are exempt from the requirement to build one more affordable unit than required – which would translate to one unit instead of zero – he said he didn’t recall discussion about it. “It’s a point that deserves to be debated,” he conceded. Town Meeting will vote on the proposed articles at its annual meeting. The articles are subject to amendment during debate and consideration. This news summary by freelance Rebecca Braun, the second of two parts, was published Saturday, April 13, 2019. A.J. Liebling: "Freedom of the press belongs to those who own one." | Copyright © 2006-2019. All Rights Reserved.